At night all cats are grey, so you could freely translate "Colours In The Dark". But if you know the Finnish soprano Tarja Turunen from Nightwish or her previous albums "My Winterstorm" (2007) and "What Lies Beneath" (2010), you know that she is a ray of hope in dark metal. The strongest moment comes right at the beginning: The "Victim Of Ritual" based on Maurice Ravel's "Bolero" delivers everything you expect from Tarja in a positive sense: Mystic, symphonic sounds and soprano singing, which sometimes reminds of Toyah Wilcox or Kate Bush, meet hard metal riffs. For almost six minutes one is inclined to pull out the highest note and considers it possible even after the second piece, the rather catchy "500 Letters". But then there are the eight remaining tracks, where there is hardly any tension left. 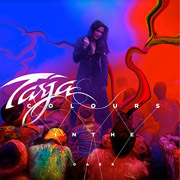 No matter how cleverly placed the riffs may be, or how powerful the orchestras and choirs may be, Tarja definitely shot her powder after the first two tracks and then saves herself with platitudes.